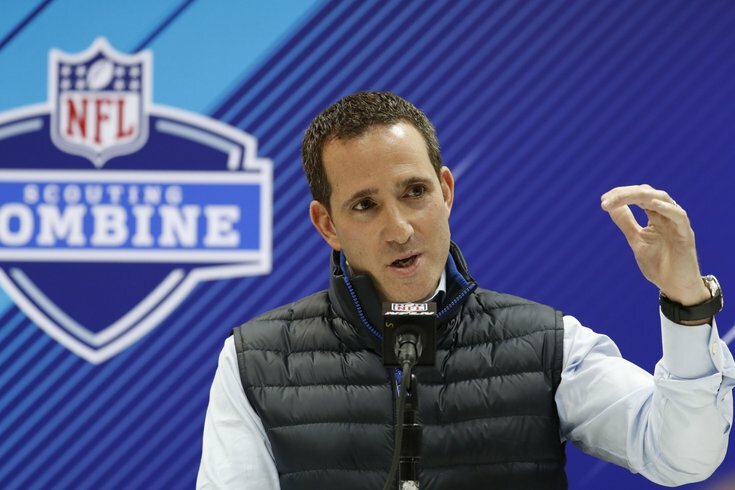 Howie Roseman and the Eagles are likely to address the trenches early in the draft. Two years ago, leading up the 2017 NFL Draft, we laid out the Eagles' top 10 options with their first-round pick. The Eagles' possible picks were much easier to narrow down then, as they were selecting 14th overall. We had "Sit tight and land Tennessee DE Derek Barnett" as our No. 3 option. Last year, the Eagles were drafting 32nd overall after winning the Super Bowl, so making predictions of who they might end up picking was more of a dart-throwing exercise. Still, a combination of options No. 1 (trade out of the first round) and No. 7 (draft Dallas Goedert) happened. This year, once again, a lot of different things could happen with the Eagles' first pick. Here, we'll take another crack at what the Birds may do, ranked from 10 to 1. The Eagles don't value linebackers, and it's a very weak linebacker class. For you linebacker lovers, forget it. Wait, what?!? Why is this option only ninth on the list?!? Well, to begin, like linebacker above, the Eagles simply don't value running backs much, or perhaps better stated, they feel like they can find backs without dumping valuable resources into the position. They haven't drafted one in the first round since 1986 (Keith Byars), and did not address the position in the first two days of the draft in each of the last two years, despite (a) loaded running back classes and (b) a need at the position. This year, there's only one first round-caliber running back, Alabama's Josh Jacobs, who could very well be gone by the time the Eagles pick. So there's that. But also, while Jordan Howard may only be a one-year lease (we'll see), the fact that the Eagles traded for him lowers the odds that the Eagles will draft a back in the first round to some degree. To note, I would also look for the team to continue to talk to Cleveland about Duke Johnson. They will not be forced to start Halapoulivaati Vaitai in 2019. They'll give Jordan Mailata another year to develop behind the scenes. They won't have to reach for an offensive tackle early in the draft. If the Eagles don't see Mailata as a possible starter in the future, then sure, they could take an offensive tackle in the first round. However, by all accounts, the team seems very intrigued by Mailata, and will at least wait and see with him. In my view, the only way the Eagles draft an offensive tackle in the first round is if one is there to be had at a great value. Of course, that pretty much never happens, because offensive tackles tend to be wildly over-drafted. In 2017, the Eagles were willing to draft a player in Sidney Jones in the second round who they knew would not help them that season. Jones was thought of by many as a top 15 type of talent, but after he tore his Achilles at his pro day, he fell out of the first round. In 2019, there's a top 10 talent (arguably top 5) in Mississippi State DT Jeffery Simmons who tore his ACL while training for the draft in February. He's an awesome player, as already noted. He is a penetrating force with a repertoire of pass rush moves who would be a great fit next to another former Mississippi State Bulldog in Fletcher Cox. Actually, Cox seems to be the player most often mentioned as a good comparison to Simmons, in terms of skill set. Two Fletcher Cox's on the interior of the Eagles' defensive line would be bad for the rest of the NFL. Maaayyyybe he returns to the field before the end of the season, or at least for a potential playoff run? The Eagles are Super Bowl contenders, right now. Getting an immediate contributor in the first round would be helpful in getting back to the Super Bowl. Off the field, Simmons is best known for a video showing him punching a woman repeatedly when he was in high school. Any team considering drafting Simmons will have to thoroughly evaluate his character, though it's worth noting that Simmons seems to be making the most of his second chance. Prior to the 2017 draft, it should be noted that the Eagles did a ton of homework on Joe Mixon, a player with more serious character concerns than Simmons. There are examples of players who "redshirted" their rookie season who eventually panned out, like Cowboys LB Jaylon Smith. There are far more examples, however, of players who did not pan out under similar circumstances. So far, Jones has been a disappointment. That could help scare the Eagles off. Whether the Eagles go the Simmons route or not, it will be interesting to see where he lands. Let's address cornerback and safety separately. If you're a close follower of the Eagles and watch all their games, you'd know that they had an absurd number of injuries in the secondary, which contributed heavily to their struggles against the pass. In fact, the five corners on the roster at the start of the season -- Jalen Mills, Ronald Darby, Sidney Jones, Rasul Douglas, and Avonte Maddox -- missed a combined 35 games in 2018. Not to mention, starting safety Rodney McLeod, and his replacement, Corey Graham, missed a combined 18 games on top of that. If you just caught a handful of widely viewed games like the ones where DeVante Bausby, Chandon Sullivan, and an obviously hobbled Jones were getting lit up by the Saints and Cowboys, you might go, "OMG, their corners suuuuuuck." And that has to be the reason so many mock drafts have the Eagles selecting a corner, right? Otherwise, it really doesn't make a lot of sense. • Mills has had his struggles against the deep ball, but he's a physical tackler and has provided good coverage in the red zone. • Maddox had an outstanding rookie season, playing outside corner, slot corner, and safety, oftentimes at a high level. • Douglas had a bad start to the season when he was forced to play due to injuries, but he rebounded and played very good football down the stretch. • Jones was OK before his hamstring flared up, and he wasn't the same thereafter. He has to prove he can stay on the field, but he has at least shown flashes of talent. • The Eagles also added Cre'Von LeBlanc (24) during the season, who turned out to be one of the pleasant surprises for the 2018 Eagles, filling in at the slot corner spot. • And then of course there's Darby (25), who was a surprise re-signing by the team a couple weeks ago. There are no star players above by any stretch, but that's six young corners, some of whom have untapped potential, who are locks to make the roster. There should be some corners lingering at the end of the first round, but if the Eagles were to take one, they would then have seven corners. 6 + 1 = 7. That's a lot of corners. #Math. Which of the above corners currently on the roster would they then try to trade for 50 cents on the dollar? On the other hand, it is worth noting that Mills, Darby, and LeBlanc are all slated to become free agents in 2020, and the Eagles do value the position. Safety makes more sense than cornerback, and while there's a decent possibility that the Eagles will take one on Day 2 of the draft, it's hard to imagine them taking one in the first round. Drafting a safety in the first round -- as in, drafting a player who played safety in his first year with the team -- is something the Eagles have literally never done. Ever. The Eagles have a long-term need at safety, as Malcolm Jenkins is entering his 11th season and Rodney McLeod is playing in a contract year. However, in 2019, their starting safeties are set. If there were a top 15 type of player who fell to 25, you could make an argument for the Eagles snapping him up. However, that guy doesn't exist in this draft. There have been a few safeties mocked to the Eagles in the first round, like Mississippi State's Johnathan Abram and Florida's Chauncey Gardner-Johnson, who very well could be first-round picks, but the better value on guys like that is in Round 2. I imagine that if the Eagles are on the clock at 25 and a corner or safety is their best option, they'll try to trade out of the pick, but we'll get to that momentarily. Alshon Jeffery's cap number became expensive this season, and will be in 2020 and 2021 as well. Meanwhile, the Eagles also just traded for DeSean Jackson, and kept Nelson Agholor around at over $9 million for one season, even if it's likely he won't be back in 2020. Roseman wouldn't dump even more valuable resources into wide receiver, would he? It's not so crazy, for the right player, and by the right player, I specifically mean Oklahoma speed demon Marquise Brown, who is often compared to Jackson. In the past, Howie Roseman has stated on multiple occasions that he believes that wide receivers take a year or two to develop. By taking Brown while already stacked at wide receiver, the Eagles could be patient with his growth, as opposed to throwing him to the wolves like they did in 2015 with Agholor. Brown has slot/outside receiver versatility, so he could take over in the slot for Agholor in 2020, and eventually for Jackson on the outside. In the meantime, if he can produce in a more limited role in 2019, then great, that's just one more thing for opposing defensive coordinators to have to worry about. I don't think I've seen a single national mock draft suggest that the Eagles would take an interior offensive lineman, but I believe that is a real possibility, for three reasons. It's a short-term need: The Eagles could use a plug-and-play starter at guard if Brandon Brooks is not yet ready to return from his torn Achilles by the start of the 2019 season. Even if Brooks is ready to go, the Eagles need more interior OL depth with Stefen Wisniewski moving on. It's a long-term need: Jason Kelce seriously considered retiring this offseason, and the fear of losing him likely prompted the Eagles to give him a raise. Still, Kelce's non-football future is on his mind, and should he hang up his cleats anytime soon, the Eagles will need reinforcements along the interior of the offensive line. Ideally, if the Eagles were to draft an interior offensive lineman, he would be able to play guard and center, and be the heir apparent to Kelce in the middle. Or at least if he can play guard and tackle, Isaac Seumalo could maybe be the center of the future. If he's a guard only, no thanks. Deep iOL class: There are a lot of interior offensive linemen who could come off the board somewhere around the 25th overall pick, like Jonah Williams, Garrett Bradbury, Cody Ford, Chris Lindstrom, Dalton Risner, etc. If all the appealing defensive ends and defensive tackles are gone by the time the Eagles pick, bolstering the trenches on the offensive side of the ball would be boring, but prudent. There's a thinking that there isn't much of a difference between picking around pick No. 25 overall, and picking in, say, the middle of the second round. Every year, teams trade up into the spots at the end of the first round from second round. Part of the reason for that is they like to have the benefit of potentially exercising that player's fifth-year option at the end of their rookie contract. "When you look at the numbers based on what the option year is projected to be, there are some incredible values by having the fifth year of the deal, and I think that's why you see teams that are jumping from the second to the first round, because everyone is aware of those discussions," Roseman explained last year prior to the draft. The Eagles currently have seven picks in this draft (the NFL average is eight), with two in the second and fourth rounds, and none in the third and seventh rounds. If they're on the clock at 25 and there's nobody left that they absolutely love, then trading back for the second straight year would make sense. If you read me often enough, you already know I think the Eagles should draft a defensive lineman, whether that be at defensive end or defensive tackle. Either-or is fine. • Defensive end: The Eagles worked out a new deal with Brandon Graham, which made the team more comfortable dealing Michael Bennett. Still, this is a position where the Eagles need to get younger, with Graham (31) and Vinny Curry (31 in June) getting older, and Chris Long (34) potentially not even playing this year. • Defensive tackle: The Eagles made the obvious decision not to exercise a 2019 option on Timmy Jernigan, and they also said goodbye to Haloti Ngata, who retired. To replace Jernigan, the Eagles signed Malik Jackson, after he became a cap casualty of the Jaguars. Jackson and Fletcher Cox should be a very good DT tandem, and Treyvon Hester showed flashes last season. Still, the Eagles need to add to that rotation, as Cox took on a heavy workload a year ago. If they want him to be elite for the foreseeable future, they need to lighten his load a bit, while also having an eventual successor in place for him and/or Jackson. "When we look back and we look at our drafts, specifically looking at where we were in the 20's, we've had some good success at 20 and higher," said Howie Roseman, speaking at the 2017 Senior Bowl. "I think there is a line where you don't get a difference maker. This is your opportunity, in the first round of the draft, to find a difference-making player. That's our first priority, is bringing in a difference maker to the Philadelphia Eagles." In order for the Eagles to get into a spot on draft day where they think the "difference makers" can be had, they would have to trade up into the teens. Last year, the cost to move up from 32 to the teens would have been too much, especially considering the Eagles' lack of draft capital. This year, with two second-round picks and an expected deep supply of picks in 2020, the Eagles have more ammo, and the cost wouldn't be as high to move up from 25. A few weeks ago, we projected what the cost would be to make such a trade, and determined that historically speaking, the cost to move up from the mid-20's into the late teens was the equivalent of a third-round pick. I believe that the Eagles will view that kind of cost, if that's what it will take, as being worth drafting a "difference maker" over whatever will be available at 25.